Contract Details: 1 year initial contract. Signed 1 year extension on 22 March 2013. Individual Awards: PFA Team Of The Year (2012/13), A-League All Star (2012/13), Wanderers Club Player Of The Year (2013/14), Wanderers Members Player Of The Year (2013/14). Highlight: Scored his first Wanderers goal against Brisbane Roar, Round 10 of the 2012/13 season on 9/12/2013, a penalty taken to win the game after Dino Kresinger was fouled in the penalty area. Highlight: Scored the first ever Wanderers brace of goals not part of a hat-trick with two superb strikes against Melbourne Victory in Round 14, Season 2012/13 on 1/1/2013. Description: Nicknamed 'Tensai' which translates from Japanese into English as 'Genius'. One of the biggest stars in Asian football, known for his vision, technique and superb passing. Previously played for Urawa Red Diamonds and Shimizu S-Pulse, with stints in Europe for Feyenoord and VFL Bochum. Ono left the club after the 2013/14 season to join Consadole Sapporo in the Japanese J-League Division 2. Jumping the gun a little there! Yeah Fox Sports News said it's a done deal as well. Also, getting him on a 2 year deal for $500k a year is an awesome piece of business. Haha sorry Mack! Hope your proud of your apprentice! can we play part of this song when Ono scores? I'm getting him on my jersey! Careful, that stuff doesn't wash out. Now I want a Shinji tifo with "JOIN ME OR DIE" underneath it. Me too. Now make his squad number official dammit! That's the only thing stopping me. 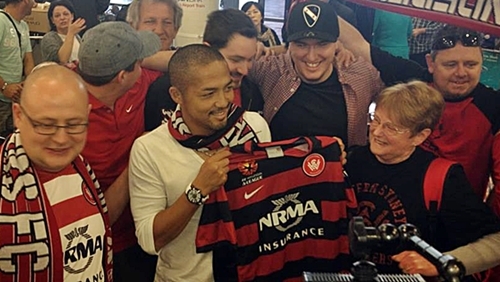 Just saw @WestSydney twitter post that the Nike store has added Ono into the list of customisation options. Apparently he's wearing #21 and having Shinji instead of Ono on the back of his shirt. Yep, Number 21 it is. Hey moxey, is there any way to get a larger size of that pic? it'd be awesome as a background! Yeah, got it off Zimbio. Might create a Wanderers photography thread like the RBB videos thread? Haha go for it! I've been meaning to make a photo thread but didnt think people would upload!